Hello folks, just popping in with our mid month reminder and an update on what's happing on the crafty front at Sir Stampalot. Also to remind you that it's time for voting in the 2012 Craft Awards, I've added a direct link to the sidebar and soooooo hope you will vote for Sir Stampalot, plus everyone who votes is in with a chance of winning some awesome craft goodies. 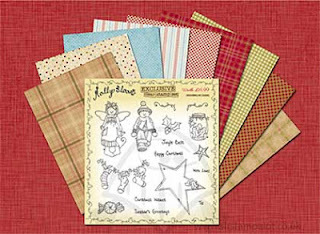 As always, lots of new goodies in store including the limited edition Molly Blooms Christmas magazine which includes some exclusive Molly Bloom clear stamps and coordination DP's, then there's new yummy Christmas DP's from Kaiser.......got mine and really pleased with them, the are lovely traditional colours with a real vintage feel to them, stamps from Inspiration Crafts plus new magazines including Take Ten, you will find them all here in the What's New section. Our September inspirational challenge is going well and we have had some lovely entries, but if you have not had time to join in yet, fear not and there is still have plenty of time. You can check out the inspirational photo and the great prize up for grabs this month here. Following the last couple of months where we spotlighted members of our design team, this month Ruth and myself are in the spotlight............. it's a tad odd spotlighting yourself but I'm just following the trend. Ruth is another one of my talented teamies who I have been fortunate enough to meet when she visited from 'across the water'. She is a talented artist and has her our own range of both digi and rubber stamps, but I will let her tell you a little bit more herself. I live in Northern Ireland with my husband and two sons aged 21 and 18. 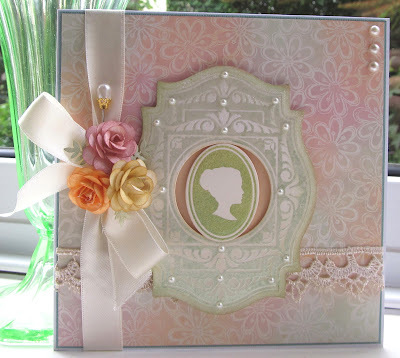 My crafting journey started when I was very young and has included all sorts of things since then such as knitting, sewing, flower arranging, drawing, cooking and gardening as well as card making. 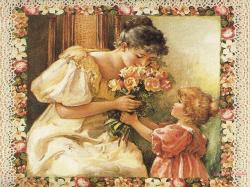 I was embarrassed to be shown a card lately which I had made for a friend when I was 9 years old! I've always been a "hands on" type of person and have worked with my husband for 12 years on the property renovation business. That has brought about many challenges over the years but I really enjoy it. There is always a great sense of job satisfaction when a project is finished. My crafting has taken a new direction in the past couple of years and I would really love to go down that route in a full time basis. 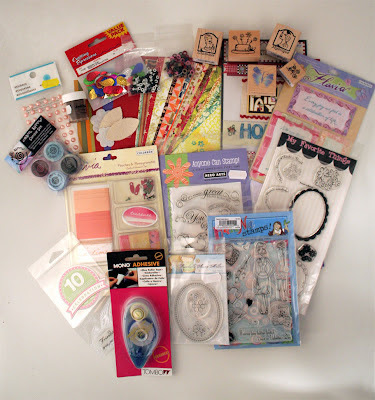 Several years ago I bought a little packet of gems for a card from the Papermilll shop in Antrim and when I came home I checked out the Docrafts website which was advertised on the back. From that day on I have been closely involved with their forum and have made many good friends. However, Blogger has a lot to answer for! 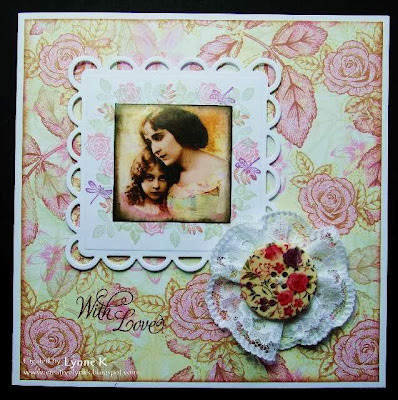 When I first set up my blog http://apassionforcards.blogspot.co.uk/ I just posted a few cards now and then. 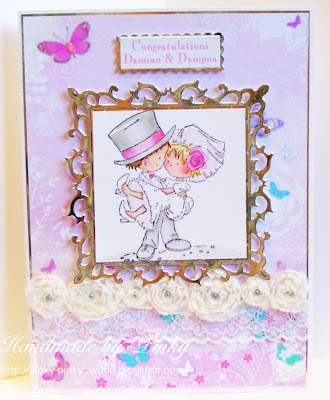 Most of the cards I was making featured my own drawings and I had so many requests that I set up a 2nd blog http://apassionforstamps.blogspot.co.uk/ with my digi images. Soon afterwards I got in touch with Brenda http://stamping-fantasies.blogspot.co.uk/ and we became good friends in no time at all. I have family who live in Cambridgeshire so planned a "get together" with Brenda at Sir Stampalot last summer. We had a lovely time (Eddy brought cakes!) and have been great friends ever since. It was the first time I was in Sir Stampalot and it was like Aladdin's cave - full of treasures! I've had a lovely time on the Sir Stampalot Design Team. The lovely ladies there have welcomed me with open arms and have been very supportive as I have tried to fit in. Some of you will know that my crafting has taken a new direction lately. I have become closely involved with the guys at Tonic Studios and have just had my first set of clear stamps released. This has involved lots of hard work but has been very exciting. Very soon (next month!) the stamps will have coordinating dies added to the range and I'm also very busy with another project which will take a few months to appear. Most of my inspiration come from nature. I just love drawing flowers and never tire of admiring God's wonderful creation! There is always something new to admire in the garden or further afield. "I was 'born and bred' as they say, in the Cambridgeshire Fens and I couldn’t imagine living anywhere else as I love the flat and scenic landscape which stretches as far as the eye can see. I am married with a large family of children and grandchildren and a good few animals in tow as well including horses and dogs. I was forced to give up full time work soon after I was diagnosed with MS about twenty years ago, but still work part time in my hubby’s office which keeps me out of mischief. 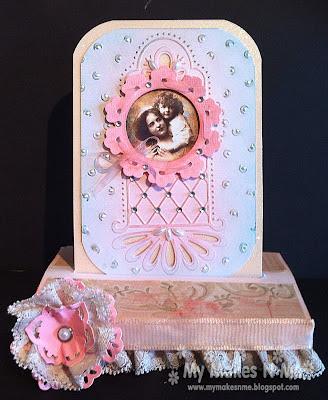 When I look back I realise that I have been crafting all my life in one form or another and as a child spent many hours sticking bits of card and paper together with flour and water, no fancy glues in those days ! Like so many crafters I did cross stitch and when my children were small had fun creating ‘Blue Peter’ inspired makes with them. 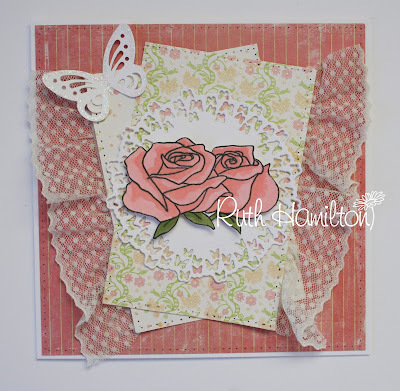 My cardmaking addiction started many, many years ago and from the start I was drawn to rubber stamping, the obsession grew as I discovered new techniques such as brayering, inking and masking and I have a particular love of silhouette stamps and distress inks. I also have a fascination with skys and creating scenes and there are not many which don't feature a moon or sun. I'm not naturally artistic and cant' draw for toffee, but I do love colour and experimenting with colour palettes which to some might be a bit 'off the wall'. My Dad who farmed all his life and grew sufficient vegetables to supply a village taught me to appreciate Nature, animals and all things botanical and this continues to provide me with constant inspiration in my daily crafting, along with the rural landscape which surrounds me. I consider myself very fortunate to be able to share my passion for crafting with others through classes, demo’s and working on the Design Teams I have been privileged to be part of and have met some wonderful friends along the way. If I was asked what my style was, I guess the nickname given me by Janice of Stampalot many moons ago sums it up ‘Botanical Brenda’. I rarely do cute, although the odd Penny Black cutie may appear on my blog now and then, but what I can say for sure is that any I use will most definitely have full facial features and usually be accompanied by the addition of a tree or some flowers !" That's it for me today, enjoy the rest of your weekend everyone. Hello peeps, it's the first Sunday of the month so that means we are all set with a new challenge for you here at Stampalot. And this month we have a bit of inspiration going on with this pretty Victorian style photo. There's lace, flowers a cute little girl and really pretty soft colours, it's up to you entirely whether you want to go with all of that or just select elements from the photo. Can I please give you just a gentle reminder that you can combine your entry with up to five other challenges, that's six of total. Any entries combining more will be ineligible for the challenge and although I try to leave everyone a note when they exceed the limit, it's very time consuming and delays the DT getting to other entries, the majority of who do observe the simple rules. It's over to you now folks, have fun with the theme and we look forward to popping along to see your entries.